But don’t blame the oil bust. 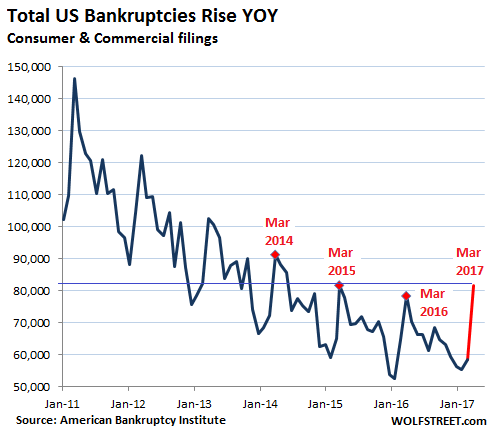 Commercial bankruptcy filings, from corporations to sole proprietorships, spiked 28% in March from February, the largest month-to-month move in the data series of the American Bankruptcy Institute going back to 2012. They’re up 8% year-over-year. Over the past 24 months, they soared 37%! At 3,658, they’re at the highest level for any March since 2013. Commercial bankruptcy filings skyrocketed during the Financial Crisis and peaked in March 2010 at 9,004. Then they fell sharply until they reached their low point in October 2015. 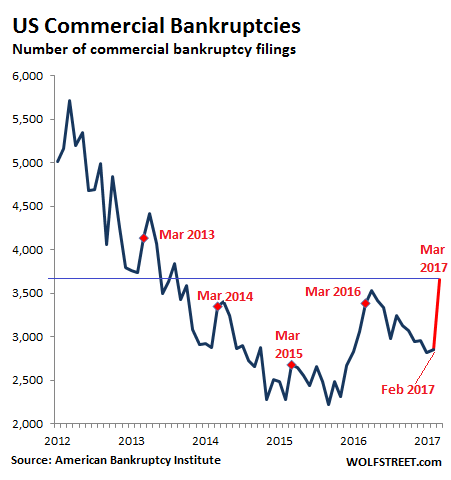 November 2015 was the turning point, when for the first time since March 2010, commercial bankruptcy filings rose year-over-year. Bankruptcy filings are highly seasonal, reaching their annual lows in December and January. Then they rise into tax season, peak in March or April, and zigzag lower for the remainder of the year. The data is not seasonally or otherwise adjusted – one of the raw and unvarnished measures of how businesses are faring in the economy. At first, they blamed the oil bust. The price of oil began to collapse in mid-2014. By 2015, worried bankers put their hands on the money spigot, and a number of companies in that sector, along with their suppliers and contractors, threw in the towel and started filing for bankruptcy protection. But now the price of oil has somewhat recovered, banks have reopened the spigot, Wall Street has once again the hots for the sector, new money is gushing into it, and oil & gas bankruptcy filings have abated. So now they blame brick-and-mortar retail which is in terminal decline, given the shift to online sales. I have reported extensively on the distress of the larger chain stores, but brick-and-mortar retailers include countless smaller operations and stores that no ratings agency follows because they’re too small and can’t issue bonds, and many of them are even more distressed. Businesses file for bankruptcy protection because they have too much debt. Even brick-and-mortar retailers with little debt can get by just fine. Their sales might decline, and they might not make much money, but they can keep going. However, brick-and-mortar retailers with large amounts of debt are toast. This is happening to other businesses too. Piling on debt in good times puts a business on the edge of a cliff, and it doesn’t take much to knock it over the cliff when adverse winds pick up. Now come the consumers – not all consumers, but those with mounting piles of debt and stagnating or declining real incomes, of which there are many. They’d been hanging on by their teeth, with bankruptcy filings consistently declining since 2010. But that ended in November 2016. The Fed’s monetary policies have purposefully encouraged businesses and consumers to borrow. But debt doesn’t just go away. It accumulates. By now, an increasing number of businesses and consumers are suffocating under this debt overhang in an economy that never developed the “escape velocity” needed – and hyped by Wall Street for years – to outgrow this debt. Rising bankruptcies are a turning point in the “credit cycle.” They’re not exactly a positive mile-marker for the economy. The irony is thick: In all major sentiment surveys, economic confidence has soared since November: consumers, owners of small businesses, and corporate executives are riding high on their own ebullience. But the economic reality is tough for businesses and consumers struggling under the hangover from eight years of ultra-low interest rates. So if you issue debt and buy up all your outstanding shares. Then you don’t have cranky shareholders to listen to. Just your friendly bank. The moral hazard created by the great bank bailout after the 2008/2009 near collapse will show it’s ugly head soon. I suspect there have been lots of marginal loans created in the past 5 years and particularly in the last couple. The banks expect to be bailed out. The TBTF banks can speculate and engage in reckless lending with wild abandon, knowing the Fed and middle class taxpayers have their backs. Yellen the Felon doesn’t appreciate the rare honest journalists who dare ask inconvenient questions about the Fed’s racketeering with its Wall Street cronies. No need to worry about our delivery systems. A bankruptcy doesn’t end a good business. It merely transfers the ownership of that business from greedy impatient speculative fools to prudent decision-makers and long-term thinkers. This is a win for workers and employees of that business. The company can grow again now that the idiots are gone. – Agree, because interest rates kept falling after 2008 (No, I do not blame the FED) people (banks, investors) started to “Chase yield” and issued & bought more (and more) “High Yield” paper. – But this game of “Chasing Yield” is being played in EVERY “economic recovery”. E.g. in the timeframe 2003-2007. – I also blame the rise in premiums for Obamacare and the increase of the on-line sales. Subprime mortgages? This article is about bankruptcies, not mortgage defaults. And there wasn’t a word about subprime. It’s a different animal. When borrowers default on a mortgage, they generally don’t have to seek protection from creditors in bankruptcy court. In most cases, the bank will just foreclose on the home and leave the borrower otherwise alone. So foreclosure issues are not captured in this bankruptcy data. There wouldn’t be rising bankruptcies in the absence of these historically large mortgage payments. The bank will just take the home back when the owner stops making payments. In a commercial bankruptcy, the bondholders get paid first after assets are sold in the market. Who wants to buy these useless, giant retail buildings? Will the Fed ride in and save the day? They can’t even dump their current balance sheet? Hey Wolf, can you speculate if the Fed will be allowed to buy these useless properties from developers in the next crisis? The end result is excess, empty inventory and falling prices irrespective of ownership. The outcome is much the same as commercial. Who wants a depreciating asset like a house in an environment of falling prices and cratering demand? In 2010, we bought a house out of bankruptcy with a 15 year mortgage from the credit union. The home price had 15 percent of the sales price knocked off and we received the $8000 first time homebuyers’ credit. The proceeds of stock market gains from the last seven years have allowed us to pay off the mortgage eight years early. A similar house in our neighborhood is selling at a price ten percent higher than our pre-discounted home (so the home prices have been jacked up at least 25 percent in seven years). There was a personal bankruptcy filing in the case of the former owner of our house. Therefore, BK and foreclosure can occur simultaneously. Of course, they CAN occur simultaneously, but the sun CAN also rise simultaneously but doesn’t cause the bankruptcy. That was the point: these bankruptcies in the article aren’t caused by subprime mortgages that are “imploding,” as commenter “Your Good Friend” had claimed. They’re caused by other factors, such as consumer loans, credit cards, or medical debts, for example. Mortgage defaults didn’t trigger the wave of bankruptcies during the Financial Crisis. Bankruptcies were triggered by people losing their jobs and not being able to pay consumer debt and healthcare debts and the like. And that’s the case now. Are not bankruptcies typically the result of excessive personal debt where the debtor can no longer kick the can down the road? I think everyone knows what happened: the banks got bailed out and wound up with all the houses. (and big bonuses) too. Millions lost their homes and home equity to become renters (home ownership in the US is said to be back where it was in 1967). Investment banks got their houses for less than half price and have rented them back to the former owners. Blackstone Group alone owns 48;000 former middle class homes. But now rent increases along with forced, and much higher, health insurance premiums leave working people with very reduced disposable income. Food is up, so s most everything else; an ageing shopping mall here in Miami is filled with thrift and dollar stores and the discount day, Wednesday, features check-out lines 40 people long. The political and media authorities pretend retail’s disaster is online shopping’s delight, but look at the bankruptcies in retail: people can t afford to consume. The policy of giving everything to the TBTF banks (said to now be 30% larger than in 2008) has killed America s middle class and small business culture, once the envy of the world…while our politicians sat on their hands, or worse, fattened their own purses. Someone should have explained to them, I guess, that if you want a ‘consumer economy’ you need consumers! So many working people here in Miami can t afford basic food clothing shelter anymore and can t improve their income or career prospects; it s a disaster. Our sad devolution from Republic to oligarchy is complete. They come up with these platitudes and then believe them. It was suppose to trickle down. By mindlessly casting votes for members of the Republicrat dupopoly who are bought and paid for by the Wall Street grifters, the sheeple have willingly bent over for their oligarch masters. As Gershon has said so I say again “Well said”. Alas I sense the entire system will implode as it has to. So we may be able to start over with a debt jubilee and a fresh slate. Sad as it may be that is what I figure what we are all facing. what is the Insolvency rates? bankruptcies are more commercial, and hung up in another paradigm. The clever bankers today force people into insolvency. Wolf, know the difference. don’t you think that the model for the contemporary u.s. economy going forward is similar to 16th -19th century england and france? 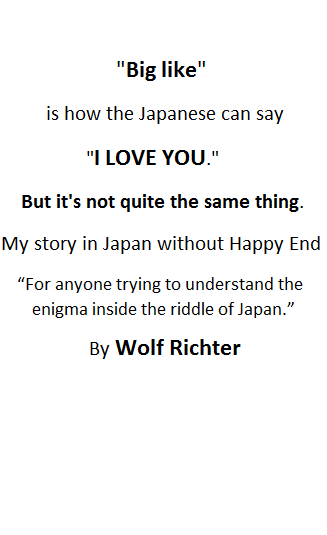 japan even. an aristocratic class surrounded by serfs. Can’t happen today.. Back then it was an agrarian society. Today it is urban. And you don’t think entities such as the Silicon Valley , HiTech in general , Petroleum , Banking , Health Care and Pharma are the modern day equivalent if not worse aristocrats ? Well, if you understood the 16th century you’d know that the serfs were actually looked after by the aristocrats. It was a mutual relationship. The aristocrats needed the serfs to work their fields and do the work. Oh there were bad aholes just like always but in general the serfs were not allowed to starve or die..
Today, there is no social or business relationship between today’s poor and the CEOs. And it appears that even the social contract between We the People and our government is diminishing. So comparing today’s debt slaves to the serfs of the 16th century is rather disingenuous. Today’s *serfs* live more comfortably but have much less in a social contract with the aristocrats for a stable or secure life. This uncertainty I believe will come back to bite our society as the income inequity advances and robotics take away the jobs. IMO this could leave many millions hungry and homeless in a land of plenty. Not a good receipt for the future. Falling prices to dramatically lower and more affordable levels is the only path forward. With the way demand and consumption is cratering as a result of grossly inflated prices, we’re going to get a whole lot of lower prices. Yes BUT with the levels of debt everywhere and how monopolized our economy is, lower price could easily take out our entire delivery systems. We don’t have much grown or produced locally. I just don’t think most people realize how fragile our entire system is. To complex and to tied together. Think dominos falling. Where do they stop? You want to know why not take the pain and get on with it. Derivatives! They entangle all this huge pyramid of debt. The TBTFs would have all collapsed taking down all the GSE and many pension funds and insurance companies and world trade. And we are now in a worse mess because the TBTF and all their minions just couldn’t help themselves but to keep gambling and playing monopoly. They are still trying to win the stupid game at the risk of taking down the entire world’s economic and trading systems. Nuts! Maybe… in some cases. But what about the other 99% of bankruptcies- the ones where the assets are sold off and employees are put out in the streets? And if you think idiot business managers are replaced by “prudent decision-makers and long-term thinkers.” you need to get out into the real world sometime. Consider small fishing communities in Mexico…they may catch the occasional lobster, but eat rice and beans…. The price of Lobster will not decline so that the poor fisherman can afford to eat his catch. To whom does one say this ? Your creditors .. & your bank. Okay .. so how do you repay the monies you owe the bank ? Because if you cannot .. you have screwed them also. So where does new money come from .. new investors ? Who would be so stupid as to .. invest money & /or on advice .. with a bank that cannot choose sustainable clients. Or have I got it horribly wrong ? This is global money, equity capital and debt capital, from all kinds of sources, in all kinds of countries: private equity firms in the US or anywhere, Chinese investors, global stock market investors (energy IPOs are hot again), buyouts by other energy companies, Japanese investors, regional banks…. ‘So where does new money come from” ? It starts at the Fed, where money/credit is conjured from nothing. Then the new money/credit is given (the paperwork shows as near zero interest set debt) to their confederates in banking. Then it is “fractionally reserved” into 20 to 50 times it’s original amount through the magic (deceit) of the Too Big Too Exist banks. That’s where it comes from. All Central Banks have a claim on all your assets and income since they have the implicit security of the nation(s) they reside in. Bankers and their crony friends go on a ride and you get taken for a ride. The Fed owes 4.5 Trillion they can’t unwind. Many years ago, when hire purchase was the craze .. I can only speak for Victoria Australia .. because that is where I lived .. many consumers purchased all manner of goods & including furniture & white goods .. shipped them off to parts unknown .. & vanished. The naive retail store’s were left high & dry. Things look grim & times are tough .. the system that we are under is not a viable working model .. in all walks of life & most especially in business & banking .. changes need to take place on a regular basis .. every new generation’s needs & desires are different .. business like banking need to change with the times .. unfortunately .. no one likes change or understands the change that is necessary & sometimes it calls for drastic change which everyone is loathed to execute .. only to their detriment. I would like to purchase a product to the value of $600 on line. I need to talk to someone .. a real human being .. about the produce to see if it is actually the product that I think it is .. the info on line is not enough. You see I hate mucking around & wasting time. I also hate waiting around for a delivery that could come today or tomorrow or next week. It cannot be left outside where it could vanish. It could be delivered to my next door neighbor by mistake & he would never give it over .. the unscrupulous man would simply deny it arrived. It could be delivers to the post office & I could collect it there. Who said this was easier than me ringing the retail store & getting them to put one aside for me till I get there to pay for it 7 bring it home. The open secret about oil and NG companies is the reason bankruptcies have abated is not due to the measly “recover” in price, albeit end consumers are getting clobbered, especially with NG. Bankruptcies are down because US oil and NG companies have dramatically cut their costs in just three years: back in February the breakeven cost for a barrel in the Bakken was just $39. And it’s bound to come down some more. While new technologies such as pad drilling (which has also made rig count largely irrelevant as a parameter, but algos are still fighting the last war) are largely responsible, they also allowed oil and NG companies to produce more with less hardhats. We are still not at the same levels as when John Deere introduced the 7760 in 2008, which allowed two men to do the same job as a nine-men crew, thus changing the cotton industry in one stroke, but it’s another take on “gutta cavat lapidem”. Instead of hiring back all the 10 hardhats fired during the last oil bust, the oil company will hire back just 7 or 8 and still pump more oil than ever before. More decently paid jobs gone forever. This initiates the usual cascade. The oil company CEO may receive a big bonus but he’s just one man. He doesn’t shop at Lowe’s and he doesn’t drive a Camaro (if they still make those). He may buy a new Porsche but that’s about it. By contrast those laid off oil workers will have to make do with less, thus affecting the whole economic food chain, from local grocery stores upwards. Again, “gutta cavat lapidem”. In theory, when the technology has advanced far enough we’ll have a few people maintaining a computer that runs everything on Earth, and there will be one profitable company that owns it with a very highly paid CEO. Everybody else will be on food stamps and housing assistance (in meager low-end condos), paid by that one company. This is the Oligarchy. The people have a right to vote against this, but they will still be arguing the issue of whether trickle down works. Also known as: How every game of Monopoly ends. 1) what happens to that freedom when your investors expect then pressure you to start turning a profit? 2) was it ever freedom when you are accountable to said investors? Do you work for yourself or for the VC backing you? The “Launch” Festival for startups was held April 6th and 7th at the Palace of Fine Arts in San Francisco. How many “entrepreneurs” were there? Thousands upon thousands. All “venture funded”? Less than one percent, or they would not be there. Most of them are living hand-to-mouth, or on some relative or friend’s money. I never hear about “freedom” as a reason for pursuing an idea that, in 90% of the cases, amounts to zero income plus ancillary debt. VCs receive dozens of “ideas” from would-be hopefuls and fund about two out of four hundred. It is not what the popular press would lead you to believe. Since we work for ourselves, people talk to me a lot about what that’s like and the #1 reason I hear for why people want to make the jump is “freedom.” And I remind everyone freedom only applies if you haven’t borrowed money, otherwise, whoever issued you that loan owns your business. Same with houses and mortgages, if you have a mortgage, guess who owns your house? Hint: not you. The Fed has pushed so much cheap cash into the system, businesses can get loans and/or VC funding for ideas that are barely sound and in most cases not grounded in fundamentals. Those two out of four hundred that got VC funding at the festival? That’s probably two too many as it is, and I hope they understand what they just signed up for. Of all the startups I’ve seen and entrepreneurs I’ve met, the only ones that have succeeded never borrowed money. If a business can’t make money to sustain itself, how good is that business model? I agree with MaxDakota, although there are some cases where new start-ups need to take on debt, and can be successful. When my father and I started our wheat seed genetics business in 1993, we knew it would be a few years before we had any revenue, let alone profit. So we bought used equipment (tractor, planting drill, combine and seed cleaning machines), and kept our expenses to a minimum. My folks simply wrote out checks to pay for the cost of business straight up, and I continued working to make ends meet. That made our success even more sweet when we started to be profitable, and after 18 years, we cashed out by selling our company! I have worked for myself most of my life. Not in tech but in a few small businesses. My reason for working for myself was in a way freedom. I could never stand stand people telling me to do something I didn’t want to do or thought was dumb or inefficient. I just wasn’t a good employee. Yet I was good at what I did. For many it isn’t a great option because not only do you have to do the work but you do the bookkeeping, planning and sales. It really is consuming. And in the early years, most of the money is put back into the business. And there are no guarantees of success. I probably succeeded because I just wouldn’t quit. And my wife worked at a job with benefits so we had at least one steady income. And I didn’t end in the first or second business I started. There really is no real freedom in running a business because you are always the ONE who is called or has to decide so that the business stays profitable. The real freedom is when you get old and have been successful and can retire with income and money in the bank. In many cases there is no retirement because there is no way to quit because there is no one to buy you out. You can have a big sale, sell off everything and just close the doors. Not many want to do that after spending a good part of their lives building something. I have a friend with a nursery like that. Will probably never quit until some health issue gets him. Tried to sell for a decade but those who wanted to buy couldn’t come up with the money. We (99rs) have the most important act in the play. To pay. Not paying is the correct move along with enlist persist resist and urinate on the Banksters. Read “When Money Dies” by Adam Fergusson for a preview of coming attractions once the Fed debases the dollar into worthlessness with its deranged money-printing. The question is when does the Madison Avenue meme “Moral Hazard” reveal itself to be Criminal Action. Printing money and conjuring credit is limited to what the real wealth (income and assets) is in an economy. If printing money created real incomes and real wealth then no one would have to work anymore. What printing money (electronically) and credit creation does, is give new money to the Central Bank’s friends so that they can bid on assets and front run you. Once they get the fire started (hey Bob, prices are rising on X, then you are supposed to jump in and chase the dragon). The reality is no real wealth is created, only the shifting around of paper assets, as the real economy (the production of real things and real services) gets another millstone hung around it’s neck. Five small shops in my neck of the woods went out of business over the past few months. The stores are now vacant. Rent getting to expensive? I see it all the time. In my neck of the woods, developers are building condos as quickly as they can throw them up, and the units sell very quickly. The ground floor units where restaurants and shops are supposed to go in…they stay vacant for a long, long time. My theory: people are spending so much on rent/mortgage/HOA, there’s hardly anything left to support stores in the neighborhood. I would say the “velocity of life” has increased so much, no one makes time to go to “restaurants and shops” that might be nearby. There is more personal satisfaction to staying home and cruising the internet. Your friends are there. Snapchat!! Why go to a “shop”? Get better selection, get it cheaper online. Why eat out? Total time spent, better spent heating frozen dinner+online. And no worries about tips. A lot of small mom and pop shops are closing in my neighborhood as they can’t compete with online stores.. It could also be the cost of opening a new business has just risen to the point where the risk is just to great or the money to hard to come by. Most of the mortgages are still being sold to FNM and FRE… so the money is quickly rotated but not so with commercial lending. Especially smaller shops. They borrow from the local banks who are much more prudent in making loans.